I took delivery two seasons ago of a well-used 1995 Sea Ray 370. I bought this boat sight unseen via eBay. When I received the boat, I was more than disappointed. Apparently, the previous owner allowed his son to live aboard, thinking it was being taken care of. The finish was completely chalky and the first season I buffed with heavy 3M compound and then with Finesse and got decent results. The problem came when 1/2 way though our short season in Wisconsin the chalkiness returned. 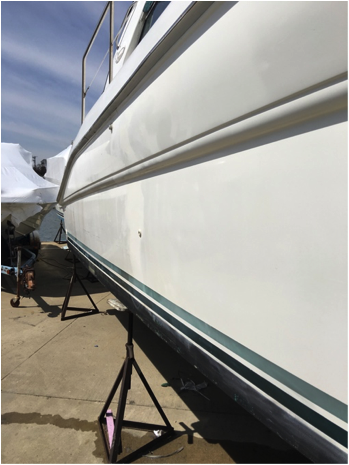 By the last half of the season I gave up even washing the boat as the dirt covered my embarrassment of the chalky finish. I had seen Glidecoat first in Amsterdam at METS and being a mid-western man who was raised to be a skeptic I filed this in my mind with snake oil. After doing some research though I concluded that what they were saying about sealing the gelcoat and making it super smooth made logical sense. I decided to open my wallet and purchased a variety of the products in hope that it would perform 1/2 as well as it looked on the internet. This season I started with a full Nano Wash and proceeded to Buff with the Nano Compound. The results were amazing, I felt like I could see the gelcoat change as I went. The pores seemed to disappear and there was not a lot of residue or wheel scores of any kind. I then moved on to the Nano Polish and repeated. It just got better. One other notable thing, I live in Southern Wisconsin and the weather is quite chilly. The Glidecoat products seemed to perform well in the cooler conditions. I was the only guy in the yard not constantly cleaning my buffing wheel from build up because the compound wouldn’t dry. The finish was so good after the Polish, I was hesitant to try the Nano Liquid Glass as I was afraid I would mess up what I had already done. Applying the coating though was easy, and I was amazed at how all you did was wipe it on let it sit for a minute then buff off with a clean microfiber towel. No runs, no seam laps, just beautiful. 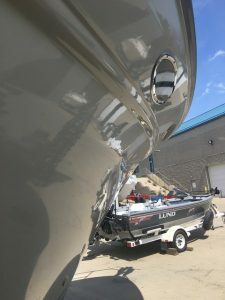 The best part is we are now 4 weeks into the season and many of the guys I was in the yard with are starting to use Black Streak remover and breaking down their finish while my boat has no streaks at all. I am completely confident that the “chalkiness” is gone forever. 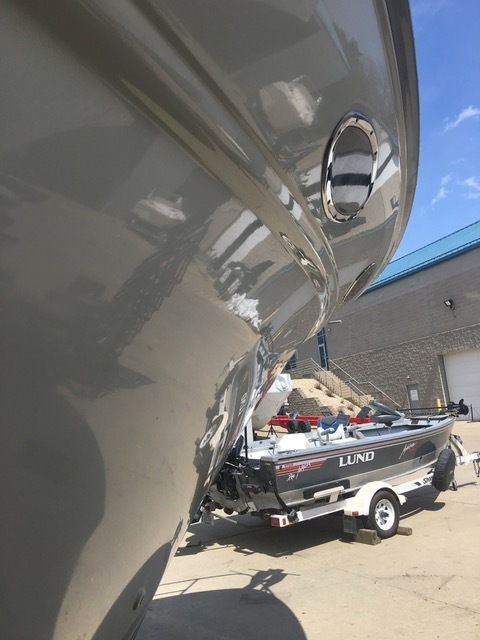 The Glidecoat Liquid Glass has really sealed the gelcoat and will extend the life of this boat for many seasons. I had many questions throughout the process as I am just a boat guy, I am not a detailer or professional yacht maintenance person and the support that was provided was awesome.